at lower left, by the artist: A Lepère; illegible inscription at upper left in black chalk:----/violet[? ]; verso, annotated at upper left: bois de chataigniers and at lower right, 53 x 38. (David and Constance Yates, NY); Helen Porter and James T. Dyke, Little Rock, AK, 2002; gift to the NGA, 2015. 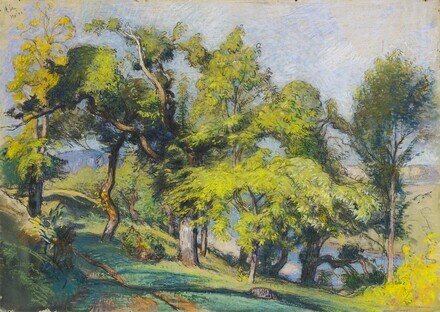 Color, Line, Light: French Drawings, Watercolors, and Pastels from Delacroix to Signac, NGA, 2012, no. 37.